Is Low Vitamin D Related to Rheumatoid Arhritis? 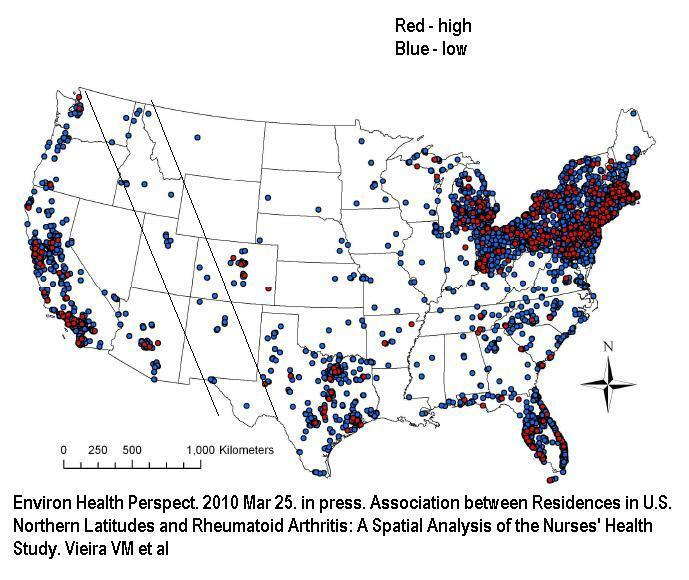 Association between Residences in U.S. Northern Latitudes and Rheumatoid Arthritis: A Spatial Analysis of the Nurses’ Health Study. Vieira VM, Hart JE, Webster TF, Weinberg J, Puett R, Laden F, Costenbader KH, Karlson EW. For years, they suggested that influenza is worse in winters because there is lower vitamin D levels in winter. Now, there is good evidence it is that low humidity increases virulence and contagibility. Structural explanation for the effect of humidity on persistence of airborne virus: Seasonality of influenza. PLoS Biol. 2010 Feb 23;8(2):e1000316. Absolute humidity and the seasonal onset of influenza in the continental United States. Proc Natl Acad Sci U S A. 2009 Mar 3;106(9):3243-8. Epub 2009 Feb 9. It is true that low Vitamin D could be related; but then Blacks, who can’t absorb sunlight, should be much worse off – wonder if that has been studied.. The model needs work. It would be more likely we are looking for a contagion, similar to C. pneumonia that is known to trigger certain rheumatic diseases, as a more likely suspect… Vit D will increase susceptibility so could be a modifying factor – and certain genotypes are going to be susceptible..
1. Osteoporos Int. 2009 Mar;20(3):427-33. Epub 2008 Jul 4. Vitamin D deficiency in patients with active systemic lupus erythematosus. This entry was posted in Rheumatic. Bookmark the permalink. One Response to Is Low Vitamin D Related to Rheumatoid Arhritis? Maybe vitamin D is low in patients with lupus because patients are compliant and practising photoprotection?